.................. 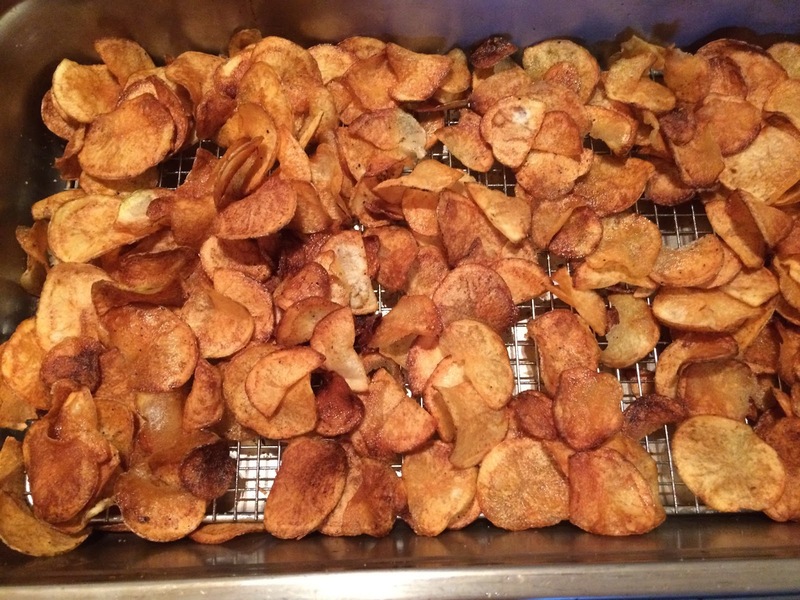 Cooking with Barry & Meta: Potato Chip Heaven! Golden brown, crisp and crunchy and they taste like potato chip heaven—homemade potato chips can’t be beat! They are certainly worth the effort. Scrub the potatoes under water until totally clean. Use a mandolin to slice the potatoes as thinly as possible. (1/8" is the thickness most recipe call for but Barry used a 1/16" cut). Barry used an antique cabbage slicer to cut 1/16" potato slices. As you slice them, submerge them in cold water and set aside. Let sit for at least 30 minutes or up to 2 hours. Note: add white vinegar to water if desired (about 1/4 cup per 3 cups water). In fryer or heavy Dutch oven, heat some vegetable oil to 375° (use a thermometer to check temp in Dutch oven). The salad spinner quickly dried the potatoes and got rid of the moisture. Lower batches of potatoes into the oil using a spatula (do not overload or the temperature will fall and chips will not be crisp). Fry for 3 to 4 minutes (more or less); remove with a slotted spoon when they're golden and crisp. Transfer to a cooling rack and immediately sprinkle on the salt or seasoned salt. We set the cooling rack down inside a pan. Repeat with the rest of the potatoes. Note: chips will crisp more as they cool. Potato Chips are ready for my class reunion -- we did about 18 pounds of chips for 40 people. That's LOTS of chips. Mix together the following . . . Recipes without photos . . .